Dark clouds threatened at the start of WOMADelaide Day 4, but after a fine morning mist, the sun came out on cue as Emma Donovan and The PutBacks took to the Internode Centre Stage at 1pm; the rain thankfully never returned. Donovan made the most of her opportunity on the main stage, and by the end of her set a sizeable crowd had gathered, responding with great enthusiasm to her soulful blues. But it was more than just the music; Donovan is such a likeable performer, affable and unassuming, she chatted away with the crowd like we were in her lounge room: commenting as she started on how lucky it was that the sun had appeared at that moment, at another point complimenting an audience member’s dancing. And then there is her powerful voice that is so suited to the blues genre she works in: so big that it easily filled the expanses of WOMADelaide Stage 1. When all this is backed by tight outfit in The PutBacks, throwing spirited guitar and Hammond solos into the mix, it all makes for a very impressive package. Opening on Stage 2 were Italian folk outfit Canzoniere Grecanico Salentino. They had the lunchtime crowd clapping along to their lively strings and percussion, but also offered the occasional softer moment of quiet beauty. Che Sudaka, an outfit formed by illegal immigrants from Argentina and Columbia on the streets of Barcelona, typify the WOMAD spirit of multiculturalism and welcome. 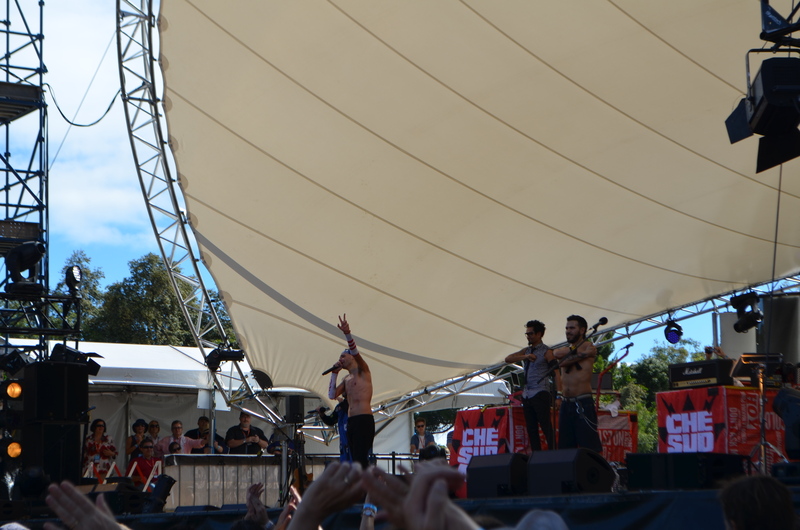 Offering a potent mix of musical styles, they took to Stage 1 with bare-chested bravado in a blistering, high energy performance. They built an instant rapport with the audience through a demonstrative stage presence and bit of crowd surfing, and by the end had everyone chanting “Che Sudaka”. In a nice touch, they remained at the front of stage to meet appreciative fans at the end of the set. Nick Waterhouse, who oozes the kind of cool associated with rock’n’roll stars of yesteryear, was well suited to the atmospherics of the tree lined Speakers Corner Stage. With a Springsteen-like connection to his band, a tight ensemble that includes baritone sax and some killer backing vocals, Waterhouse knows how to craft a sound. Offering songs from his 2014 album Holly and the occasional cover, his old school rock had everyone up and moving from start to finish. The opportunity to hear the songs of Australian indie music legend Robert Forster played with the strings of The Zephyr Quartet and multi-instrumentalist Jherek Bischoff was always going to be something special. While the voice of the laconic front-man might not be as strong as it used to be, the songs worked really well in these arrangements. The dynamics of “Dear Black Dream” was a particular highlight. One of the great things about WOMADelaide is that every year there is something a little bit different to the experience. This year had a quite a number of innovations, particularly The Colour of Time that seemed to take over the park each evening. The Architects of the Air attraction, Exxopolis, which allowed people to walk through colourful inflated sculptures, was one of the most popular experiences at the Festival with huge queues that got longer each day. Taste the World was also expanded this year from a demonstration tent to a full outdoor restaurant, with Street In The Park. While offering great ambience and some delicious taste combinations, it did suffer from some organisational issues. Read the full review here. 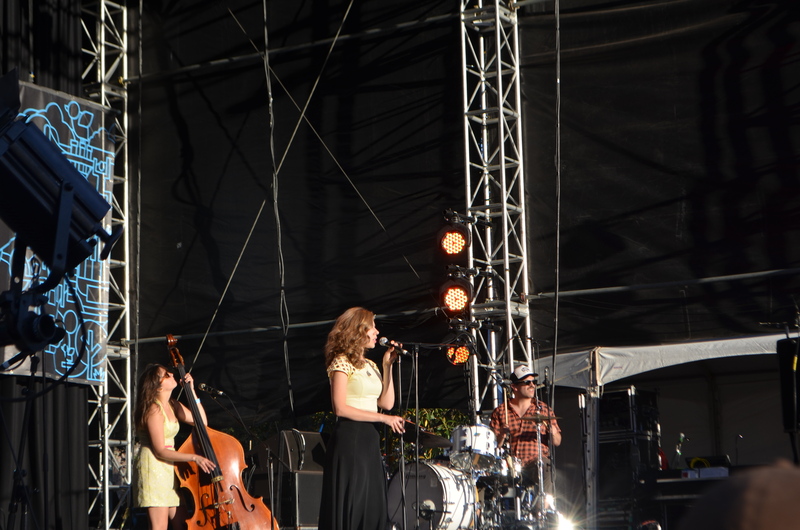 The 6 o’clock set on Stage 2 was a real treat, as Lake Street Dive performed their slick blend of indie pop with authentic rhythms and blues. A super-talented quartet who collaborate so well, it’s not hard to see why they are garnering so much media attention right now; it was a real coup that WOMADelaide were able to catch them on the rise. Completely engaging from start to finish, they craft songs with clever lyrics and smooth musical hooks. Alongside highlights from their smooth “Bad Self Portraits” album, there were some new tunes and delightful covers of Van Halen and the Eurythmics. The crowds jammed into every available space around the small Zoo Stage to hear Arnhem Land musicians Barra. The added attraction here was multi-Grammy Award winner Wally De Backer (Gotye), in an artistic collaboration that also included Yolngu Elder Djalu Gurruwiwi. The performance incorporated song and traditional dance, offering moments of beauty and inspiration. As a late inclusion on the program, organisers did well to squeeze this into an eventful festival; if only it could have found its way onto a larger space it could have garnered even greater appreciation. Neneh Cherry’s second set fared much better on the bigger Stage 3 than in the small Speakers Corner area the previous day. 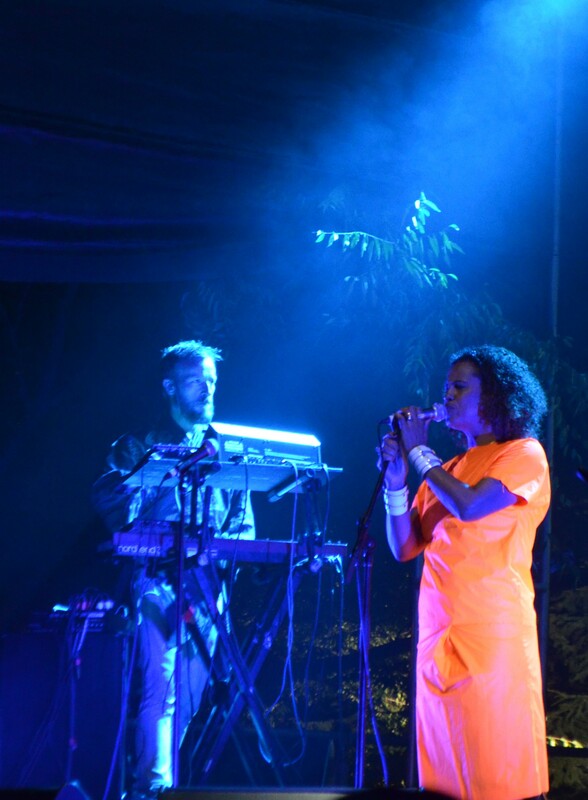 The drum and bass of her backing duo Rocketnumbernine+ filled the space, while Cherry engaged with sass and soul in a warm and charismatic performance. The feature act of the night, and one of the Festival drawcards, was Irish singer-songwriter Sinead O’Connor. It was difficult to know what to expect from a performer who has made a career out of being simultaneously enigmatic and forthright, but this was a very fine performance that showcased one of the finest voices in popular music and provided a fitting close to WOMAD. Appearing in priestly garb and sunglasses, O’Connor was initially reserved, but as the set progressed she warmed to the adoring audience, discarding the glasses and engaging in banter. Supported by an excellent backing band that made very effective use of dynamics and vocal harmonies, the sound mix was impeccable. Returning for an encore, her slow blues version of “Nothing Compares 2 U”, while delivered through a wry smile, was nevertheless stirring and delighted the audience. Read our reviews of day one, day two, day three. Posted in Community and Family, Festivals, Music, Reviews, The Arts, What's on in Adelaide and tagged Adelaide, Che Sudaka, Emma Donovan, Gotye, Lake Street Dive, Neneh Cherry, Nick Waterhouse, Robert Forster, Sinead O'Connor, WOMAD, WOMADelaide. Bookmark the permalink.